"In the last centuries of the Fifth Cycliad, a great malaise began to descend upon the lands of humankind. The great civilizations of Urth, which for Aeons had seemed on the verge of slumber, now finally began to rot from within. From the edges of the world the ever-present enemies drew close, their hungry claws poised to tear apart the delicate flesh of a fruit a hundred millennia in the harvesting. And all around, a cry arose for Heroes, to stand against the dying of the light and save the world from the sins of its past. "Some said that it was the end of days. Some said that it was only the beginning. These pages tell the history of that time yet to come. 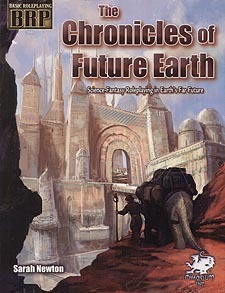 These are the Chronicles of Future Earth." The Earth we know is gone, forgotten in the depths of time. In its place is the Urth - a world of mystery and danger, steeped in a thousand centuries of history and legend, where humankind brushes shoulders with beings and creatures strange and monstrous. The Venerable Autocracy of Sakara, the greatest - and oldest - Empire on Urth, rules over half the world, led by an immortal God-Emperor whose very word is law. It's a world of deep, dark forests, brooding mountains, timeworn ruins haunted with the ghosts of the past and the weird monsters of the future. Arcane sorcerers explore strange dimensions, terrible priests wield power from extradimensional beings known as Gods, mighty soldiers forge new histories from the ruins of the past. It's a time of danger, reckoning, and adventure. Welcome to The Chronicles of Future Earth.